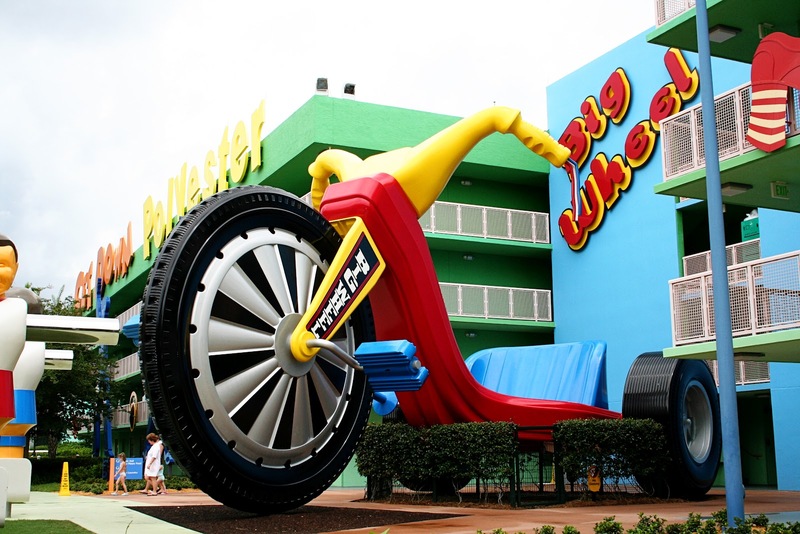 The theme of Pop Century is pop culture, ranging from music, movies, TV, and games. It’s a cute theme and is bound to elicit nostalgia from anyone who was alive from the 50’s up through the 90’s. The lobby has a ton of fun artifacts from each generation, and each area of the resort is broken up by decades: 50’s, 60’s, 70’s, 80’s, and 90’s. To go along with that, each building has a few MASSIVE props that correlate to each decade. The 80’s, for example, has a huge big wheels. The 90’s has a huge laptop. And so on and so forth. All are fun, and I was in awe at how huge they were, too. The theme itself is fun and enjoyable, and the ambiance is fine but it’s nothing hugely special once the nostalgia wears off. There is a nice lake that borders the resort, and you can take a nice walk over to Art of Animation. Other than that, though the theme is fun, the ambiance isn’t as immersive as a lot o the other resorts on property. Whereas at the moderates and deluxe resorts you feel like you’re in another world, Pop Century feels like a fun nostalgic hotel. The lobby, again, is chalk full of nostalgia. Lots of fun things on the wall to enjoy before (or after) you’re checked in. The good news is they do have a lot of people stations to check you in, but they aren’t always staffed. To be fair, we got in late (around 8 PM) which leads me to another gripe: one of my colleagues room still wasn’t ready yet. Seems a little late to not have a room ready, but at least the check-in gal was nice. I can also report that I used mobile check-in for the first time and it was great! I was a bit apprehensive, because I actually enjoy chatting with the Disney staff when I arrive. But mobile check-in was great- I got my room # sent to my phone, and I walked right to my room and entered with my Magic Band. I’ll definitely do that again. The rooms had recently been refurbished which was nice, as they were a lot more simple and modern than I recall. Very similar to how the moderate resorts are, actually, but still a few steps away. To be completely fair to Pop Century, it is a value resort and so I was not expecting anything fancy, and I got exactly what I was expecting. It was comfortable and quiet, and everything worked fine, but it’s just a simple hotel room. The bathroom is also a bit small and feels a bit weathered. If there was one pleasant surprise about Pop Century it was definitely the food options! They are limited to a massive food court, but they make the best of it! There are a number of stations with plenty of options for both breakfast and lunch/dinner. Even the options that you’d expect, like burgers, have a fun flare. They’ve clearly put a lot of thought into the food offerings here, and it shows. I tried a pulled pork sandwich one day and I thought it was great. Their breakfasts were always tasty, too. My two colleagues who are more health conscious than I am found plenty of stuff to enjoy, too, without destroying any diets. The only down side is that it does get crowded- very crowded at times- but in general, I really like the unique food options. They squeeze a lot of variety into 4-5 food stations. There is also a dessert station that makes custom Sundays and ice cream sandwiches were a delicious night time treat. Plus they have plenty of grab-and-go options if you want to stock up, or hit the parks quickly. If there was a second pleasant surprise it was the transportation which I actually think was better than the moderate resorts I have stayed at (Caribbean Beach, Coronado Springs). Pop Century only has one bus area which is near the front of the hotel (where you arrive and check-in). But, there are 5-6 stations and all are designated for a certain park (or location) and each have a nice long pathway for people to queue. The reason I like this is because it’s easy and fair. With other resorts (above), each building has its own bus stop which means depending on where you are you either have to wait for full buses to pass, or it takes forever to get to your eventual stop. All of this is avoided at Pop Century, because there is only one bus stop area! You arrive, you wait in one line, and you hop on your bus when you arrives- it was glorious, actually. I think for our entire stay that we were on the first bus pretty much every time, and I don’t think we waited longer than 10 minutes at any point. I know that Pop Century’s size (compared to other resorts) makes the one-bus-area potentially more feasible, but I actually wish they could implement something similar at other resorts. I have to be honest, I did not spend any time at the pool though I did walk past them several times. They seem nice, but nothing special. No slides, no sand bottoms, no lazy river, etc. Just a standard pool and standard hot tub. It’ll get the job done. The grounds were also nice but as I mentioned in ‘ambiance’, while it is nostalgic and fun, it isn’t a lush amazing grounds or anything. I enjoyed the scenery (especially the huge sized Mr. and Mrs. Potato Head) but it wasn’t any where near as immersive as other resorts. To be fair however, though I judge all resorts equally, this is a value resort, so I got what I expected. These things don’t deserve their own paragraph (usually) but could still be point-worthy tidbits. Each item is worth -1 to 1 points, which means places can actually lose points here! Pop Century is without a doubt a value resort, both in price and amenities. But, I think it actually stacked up extremely well when you factor in price. I really enjoyed the food court and how easy (and fair) the bus system was, as well as the nostalgia of it all. The rooms themselves were a bit meh, and it isn’t as immersive or luxurious as many other resorts on site but it is a value resort, after-all.